The man of the hour, Sezairi Sezali had a launch party of his latest single – 70’s. On a Friday evening at the Hard Rock Café Singapore at Cuscaden Road, the Sony Music singer-songwriter premiered his latest music video for 70’s. The last we heard about him was when he did a soulful acoustic performance at the opening of the long-awaited Apple Store at Orchard road a month ago. 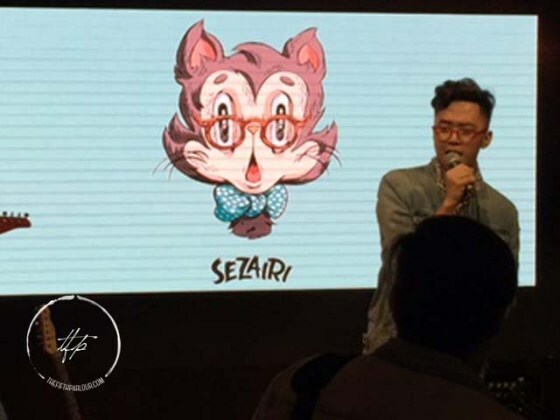 The music video for Sezairi’s latest single 70’s is playful and lively. As the lyrics suggest, Sezairi taps into the elements of the 70s with the outfits he dons in the video. People from different walks of life dance to the tune – be it a white-collar worker, a youngster or an ordinary individual on the streets. It’s all about embracing life and happiness from the fond memories of the 70’s . The colourful music video features cameos from local personalities such as Hirzi and The Sam Willows. Hosted by 987 DJ Joakim Gomez, the hour-long affair was attended by various local personalities as well as lucky contest winners. The thematic games and music from past generations was played over speakers. Attendees took part in dance offs of the 70’s and games where they had to guess the title of the songs played. Many prizes were won on the dancefloor! It was indeed a major “throwback” moment for millennials like myself, racking my brain on the songs we used to hum during our secondary school days in the classroom. The dancefloor was entertained by his covers of Craig David’s Fill Me In and Childish Gambino’s Redbone alongside with his originals – Fire on the Floor and ending the night with It will Never Mend! The fun-filled night was full of emotions as he made a heartfelt comment about his music career. He thanked his fans and his management for the continual support throughout his music career, and an encore performance left his fans asking for more! Check out 70’s by Sezairi when it is available everywhere 29 July 2017 at midnight! You can also enjoy it on the go on Spotify and Itunes! Thank you Sony Music Singapore for the invitation.